Imagine working full-time but still not being able to afford the rent and food for yourself and your children. Picture a world where committing fully to being a primary caregiver to your spouse with cancer means risking your family going hungry. Imagine if, after years of paying taxes, a medical procedure left you unable to work. Or imagine just losing your job and having to start all over again. These are just some of the stories of the 43 million Americans who experience poverty in any given year. Contrary to popular belief, poverty in the U.S. is widespread: 60 percent of Americans will experience poverty in their lifetime. 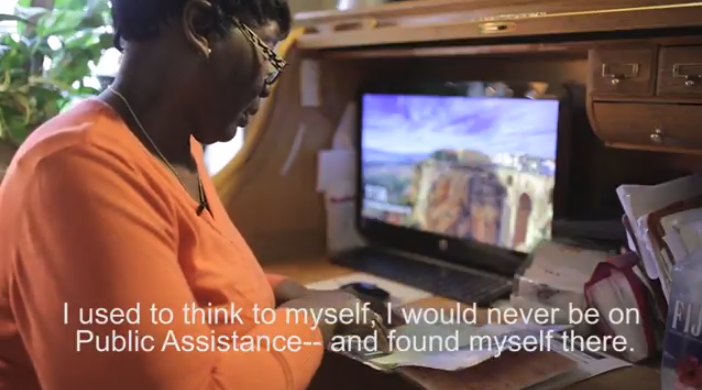 Stories of Resilience, the Safety Net Project’s newest multimedia campaign, illustrates the breadth and complexity of the human experience of poverty in the United States by sharing the stories of those directly affected. The content demonstrates the sharp contrast between commonly perpetuated myths associated with poverty and government benefits and the reality of lived experiences. As Congress prepares to vote on cuts to food stamps this week, we need to change how we talk about poverty and start listening to those affected. Narratives about those receiving public benefits depict them as scammers living large off the hard work of tax-paying Americans. This is far from the truth. The average Food Stamp (SNAP) benefit per person is about $1.40 per meal and the average welfare, or TANF (Temporary Assistance for Needy Families) benefit for a family of 3 with children is $432 per month for rent and all household expenses. Furthermore, for many, benefits are a temporary support—most poor people who avail themselves of a U.S. government safety net program receive them for less than three years. The poor are also too often assumed to be primarily people of color. Research shows, however, that whites without a college degree are the largest group of working-age adults benefiting from the government safety net. In one year, 6.2 million whites in this group were lifted above the poverty line by the safety net — more than any other racial or ethnic group. A breakdown of the food stamp program also shows that 40.2 percent of recipients are white, while only 25.7 percent are black, 10.3 percent are hispanic, 2.1 percent are Asian and 1.2 percent are Native American. Under the current administration, safety net programs and those who rely on them are under attack. This week the House of Representatives will be voting on a new bill to cut food stamps, threatening more than 2 million people’s benefits. The bill proposes the implementation of strict work requirements for SNAP recipients, based on the misinformed idea that people are taking advantage of the system and need motivation to work—despite the fact that 75 percent of SNAP benefits go to households that include a child, a senior, or person with a disability, and that 44 percent of householdsthat rely on SNAP have at least one person in the family who works. Additionally, the bill intends to fund these programs at less than $30 per month for each recipient trying to comply with work requirements, an amount woefully insufficient to meet the needs of a quality job-training program. These work requirements are projected to slash food aid of $20 billion for 2 million households. This comes a mere 6 months after Congress awarded a tax cut of more than $84 billion to the richest 1 percent of households in 2019 alone. As the House of Representatives prepares to vote on this legislation on Friday, it is more imperative than ever that Americans understand the reality and needs of the actual people in receipt of SNAP and other safety net benefits. If we continue to base policy on stereotypes and misconceptions about poverty and benefits, we will never be able to create effective solutions to address the systemic causes of poverty, hunger, and homelessness. The lives of tens of millions of Americans hang in the balance. Helen Strom is the benefits unit supervisor at the Safety Net Project. Farmworkers n New York State encounter dangers and mistreatment on the job. Upstate dairy farmers face unprecedented pressures, with some turning to suicide. And New York City buys a lot of milk. The DOE recently said a pilot program won’t be expanded until it works out some of the problems that have led to a low capture rate of organic leftovers. Justice-minded farmers are finding creative ways to surmount the barriers like the cost of seeds, changes in federal programs—and, of course, the occasional hailstorm.